Google Earth is a wildly popular application designed to bring geographical information systems (GIS) to the masses by mixing together “layers” of information. With Google Earth, you can type in an address and add roads, buildings, and photos from space; schools, businesses, and even terrain. Tilt controls allow you to “tilt” the image of the terrain, with the space photos contour-mapped over the “ground” so that volcanoes project into the air, hills look hilly, and valleys look like valleys. 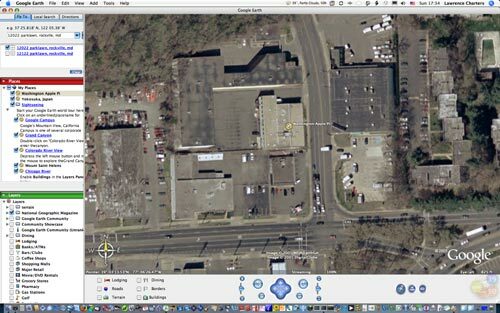 In this example, Google Earth is zeroed in on 12022 Parklawn Drive, Rockville, MD – home of Washington Apple Pi. 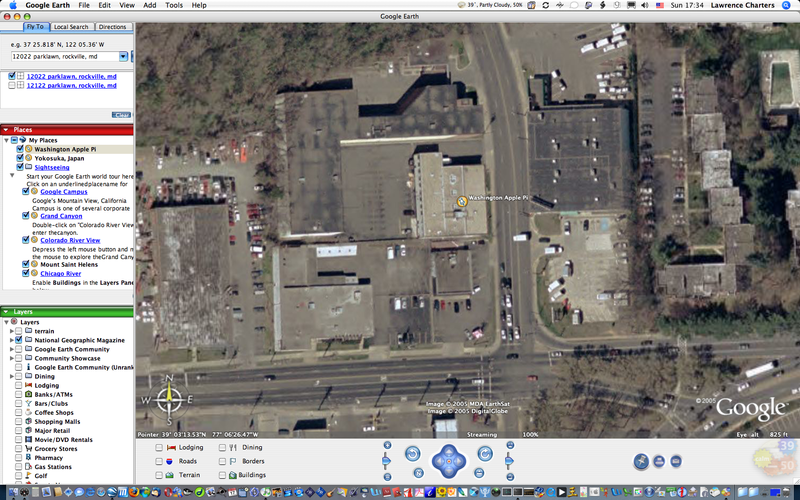 Photos from space, seamlessly “tiled” together, allow you to view the area around the Pi building and see, for example, that the U-Haul lot directly east from the Pi looks unusually empty. Washington Apple Pi World Headquarters in Rockville, MD. Click on the image for a full-size view. and an active broadband Internet connection. Tour Paris, Moscow, and the house you lived in when you were born, but don’t be too shocked to find your old house is now a parking lot, or a condo. Google has links to a special NOAA collection of aerial photos of post-Katrina damage, a wonderful tour of Mt. St. Helens, a tour of the Grand Canyon, a look at Hoover Dam – in short, a world of things to see and explore except, sadly, the North and South Poles. Take the world for a spin.